We are in the home stretch to the midterm election. Its time to kick it into high gear to take back the house and take back our country! 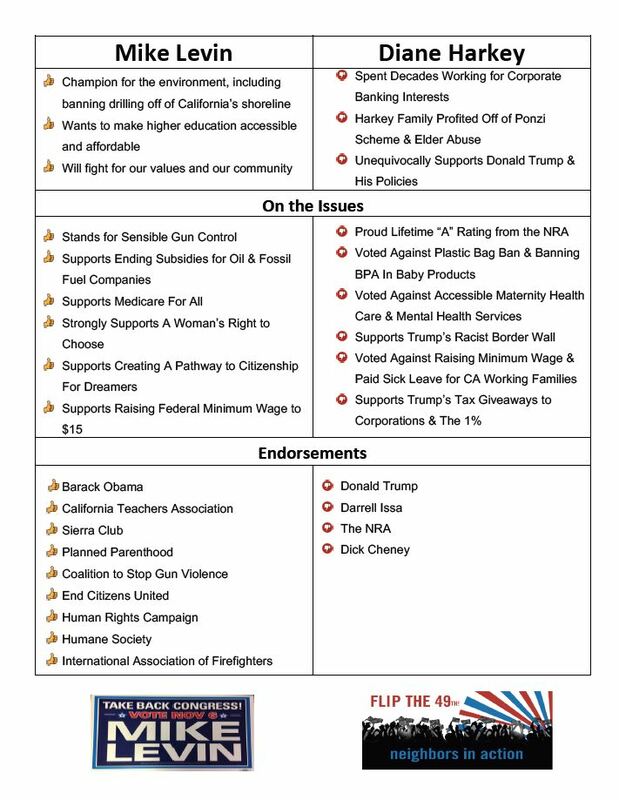 Here’s the plan: We must do everything we possibly can to flip the 49th blue and elect Mike Levin. That’s why, starting on 9/8, we are launching the 60 Days of Action campaign. Every day, until election day, we will send out a small action you can take, that if we all do together can make a huge difference. During the week, we’ll send out actions that should take less than 10 minutes. On weekends, we’ll go bigger. We're pulling together local and national events that are relevant to CA49, so you don't need to subscribe to tons of mailing lists to find out the best way to take action. We'll also continue weekly newsletters as normal. Oh, and if you have ideas or feedback, do not hesitate to reach out to us! You can reply to any of our newsletters or daily action emails. Your replies go to a monitored mailbox. We would love suggestions for events and will do our best to respond to your questions or concerns as soon as we can. Keep calling! Let's keep reminding Senators Harris and Feinstein we agree that the Kavanaugh hearings need to be CANCELLED. Like she's done her entire political career, Diane Harkey is trying to sneak under the radar to a win. She has failed her constituents and corrupted her way up the ladder. She is entirely unfit to serve our district and you must spread the word! Here's quick reference guide.